The coupon code is applicable to purchases $100 or more and includes free standard shipping. Get $20 off $100 or $50 off $150 orders. The code may not be valid in conjunction with other deals. Valid for selected men's and women's apparel on sale. Spend over $50 and get Free Shipping. Some restrictions apply. Discount will be applied in cart after promo code GREEN40 is applied. Not valid on previous purchases, special orders, special purchases; cannot be combined with other promotional offers; Not transferable. Discount offer does not apply to shipping charges or taxes. No cash value. Valid for sitewide without any minimum spent. Valid for full-priced and sale products. Limited time only. Here is how to get a code. Click on "Show coupon code". Copy the code and use it on the website. 2. Pick the item you need and click on it. 3. On the new page, choose a color, your size and quantity. Click on "Add to cart". Hover the image of the bag and click on "Check out". 4. Check your order summary and make sure you have all you want. Click on "Checkout". Type in your email to check out as a guest. Click on "Checkout". 5. Fill your shipping address and method. If the item is a gift you can choose to "Gift wrap". Click "Continue". On the new page under the heading "Payment", there is a field for promotion code. 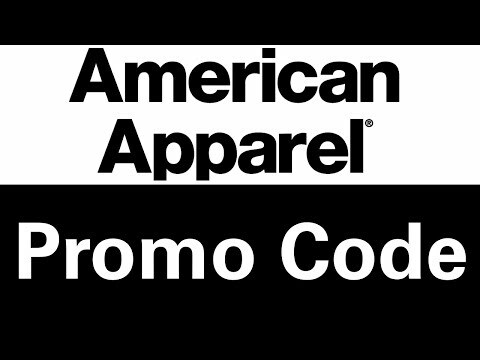 Type in your code and click on "Apply promo code". American Apparel is a brand that has items for women, men, and children. You can buy clothing apparel, such as, sweatshirts and hoodies, jumpsuits and rompers, bodysuits, pants, leggings and hosiery, dresses, active wear, swimwear, and underwear and lingerie. American Apparel also sells shoes, hat and hair accessories, eyewear, umbrellas, belts and suspenders, bags, jewelry, and products for pets. This store also gives you an option to purchase wholesale if preferred. American Apparel has items that are unique and trendy.